Kumrumbheem, Feb 19: Gangapur Jathara is one of the Prestigious events in rebbana mandal of Asifabad District(Kumaram bheem), which is conducted by the ancient Sri Balaji Venkateshwara Swamy Devasthanam.The Jathara is visited by thousands of people for every year. 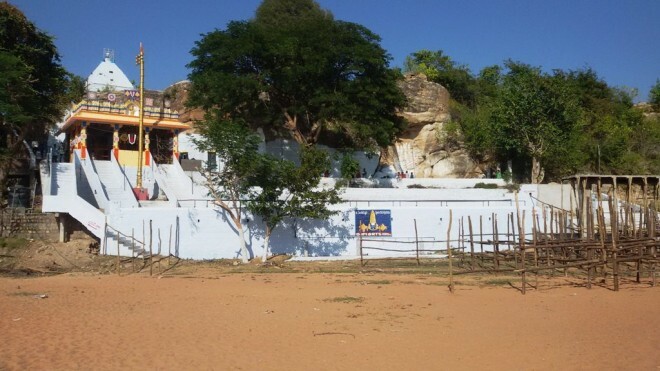 The abode of Lord Venkateshwara Swamy is believed to be one of the major pilgrim centers of this district and is situated five kilometres away from the mandal centre. Devotees from several towns of Asifabad, Sirpur (T), Bellampalli and Mancherial Assembly constituencies congregate at the holy place and throng the historic temple during the event. Around one lakh devotees from far-flung areas arrive at the village using different means of transport, mainly bullock carts. They belong not only to various parts of both Kumram Bheem Asifabad and Mancherial districts, but from neighboring Maharashtra too. According to believed ancient story, Mummadi Pothaji, a staunch devotee of Lord Venkateshwara Swamy, used to visit Tirumala Tirupathi Devasthanam every year. He regularly performed prayers at the famous shrine. But once when he could not visit the abode because he was growing older and weaker, he was depressed over his inability. So, Lord Balaji appeared in his dream and told him that he can spot him inside a hillock if he drills it. Accordingly, the devotee managed to make a large size hole to the rocky hillock with the help of a crowbar. Over a period of time, he was able to find the idol of Venkateshwara Swamy. He then worshiped the God by performing special prayers on every full moon day of Magha Masam, the sacred month of the Hindu calendar year.